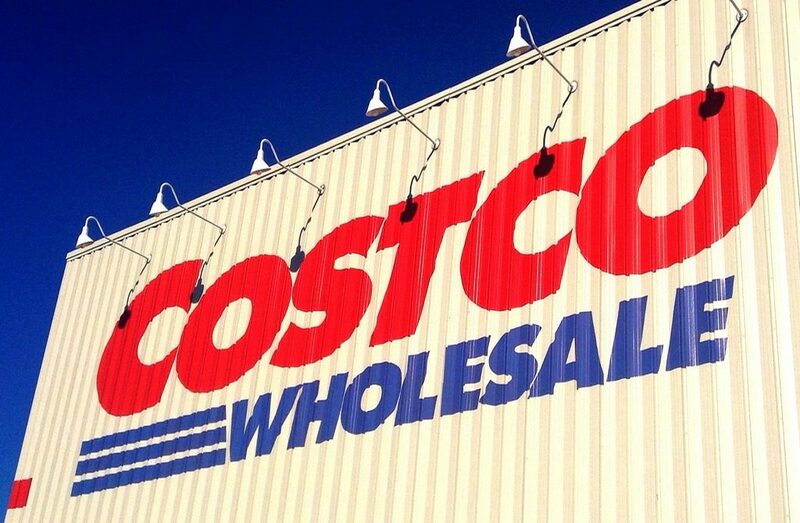 Costco members join the warehouse club for a variety of reasons. For $60 a year, you get access to great deals on electronics, clothing, food, alcohol, office supplies, tires, hearing aids, and so many free samples you can skip dinner later. What if you have no need or the space for an entire year’s worth of toilet paper? Is it worth the membership fee to join Costco only to save on gas and never even step foot inside the warehouse? Gasoline prices are always constantly changing. Prices can even be different from the time you drive by a station in the morning and again later that evening on your way home from work. This could be because the new shipment of gas in the tanker was cheaper or more expensive than the last delivery. Or maybe one gas station is having a price war with the station across the street. How much you will save from fueling up a Costco than at another gas station will vary day to day. To calculate your yearly savings on fuel, you only need the number of gallons of gas purchased and the difference between gas prices at Costco and your regular station. 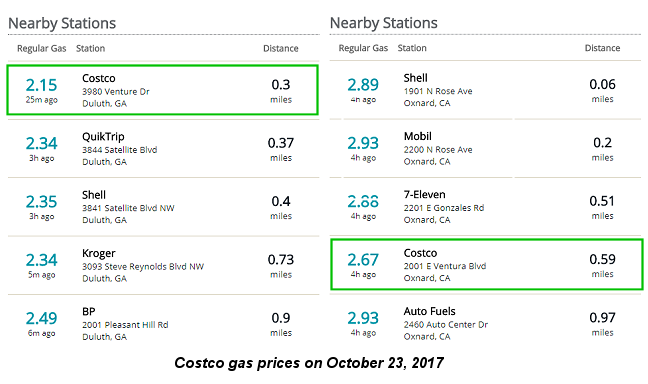 Looking on GasBuddy.com on October 23 in three cities in two states, Costco had the lowest prices among the gas stations in the area surveyed. In the Atlanta area, drivers were reporting the price of gas at Costco was $2.19 a gallon while the QuikTrip a mile up the street was $2.43 a gallon for regular. At a Costco outside the Atlanta city limits in Duluth, regular was $2.15 a gallon and QuikTrip was $2.34. Meanwhile, across the country in Oxnard, CA, Costco was $2.67 a gallon while 7-Eleven was $2.88. The savings at Costco on this particular day ranged from $0.19 to $0.24 cents a gallon. To determine the number of gallons of gas you use, you can keep track of the amount of gas you buy each week or you can estimate the number of miles you drive in a year and the average miles per gallon your car gets. Entering this information in the below online calculator will quickly calculate whether you would benefit from purchasing a membership at Costco. If you are thinking how can Costco’s gas be so much cheaper than the next gas station down the street, and “you get what you pay for”, you can fill up your tank without worry knowing that Costco branded gas meets the Top Tier Gas detergent standards. Costco is able to provide such competitive prices to their members because according to UBS, three-fourths of their operating income comes from the membership fees of their 90.3 million members. Not all Costco locations will have an on-site gas station. If you have to drive way out of the way to get to a Costco store, it might not be worth the time or the extra mileage to make the trip. You will have to do some additional calculations on the amount of gas you will be purchasing, the amount you will save filling up there, the number of extra miles to make the trip there and back, and the mileage your car gets. You might find that gassing up at the slightly more expensive gas station right outside your neighborhood will save you more money after everything is factored in. On the other hand, if Costco is already on your way or along a route you travel regularly, then you are all set. Another benefit of being a Costco member is the Costco Anywhere Visa card. This no annual fee card gives you 4% cash back for up to $7,000 a year on gas purchases anywhere, including at Costco; 3% cash back at restaurants and on travel; 2% cash back on all purchases at Costco and Costco.com; and 1% cash back on everything else. You can use any credit card with the Visa logo at Costco or a debit card from any payment network. If you have a gas rewards credit card with Mastercard, Discover, or American Express that you prefer using instead, you are out of luck. You might not think a Costco membership was worth the investment if you do not buy enough products over the course of a year to earn a return on the $60 membership. However, if your gas purchases saved you enough money to pay for the membership, anything you buy from the warehouse while at Costco for gas can be considered a bonus. There are products and services for almost everyone, which is why Costco has grown to become the largest warehouse club in the U.S. In addition to paying at the pump with a Costco Anywhere card, a Visa credit card, or a debit card, the pumps also accept the Costco Cash Card. The Costco Cash Card can only be purchased or reloaded by a member, but allows members and non-members to shop at any Costco location and pay for their purchases with funds from the card. Their website even promotes the option of businesses using them as gas cards for employees. Costco Cash Cards can be purchased with values between $25 and $1000 and they have no expiration date. Like in many financial situations, whether getting a Costco membership solely to use the Costco gas stations makes sense financially will depend on your personal circumstances. Those who have a long commute or drive many miles a year, drive a less fuel efficient vehicle, or have multiple cars or drivers in a household, might benefit from becoming a member. The more gas you purchase, the greater your savings. Are you a Costco member? What do you like about Costco? What made you decide to join their warehouse club?